Avi and Anita gets candid with Ankionthemove about all things aero and the journey with Templepilots so far......!!! Avi,the founder of Temple Pilots is effectively the most qualified Instructor in the country today. APPI International’s Instructor, Avi is a qualified and Certified Tandem Instructor, XC (Cross Country) Instructor and SIV Instructor. 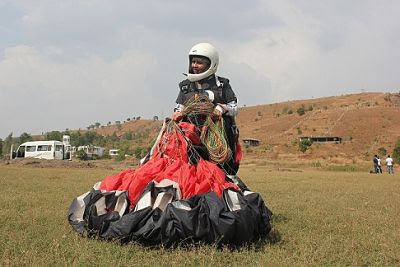 Anita flies a Zulu, Gin glider which she is quite attached to and has flown different sites at Bali, Indonesia, Kamshet, Maharashtra and Vagamon and Munnar, Kerala. 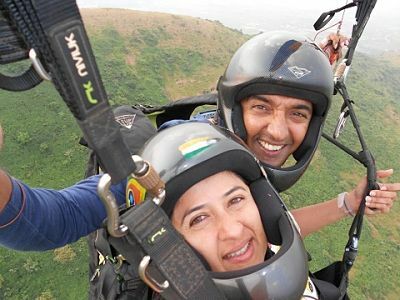 She was also the only woman pilot and Indian to fly at the Third International Flying Festival at Vagamon, Kerala. 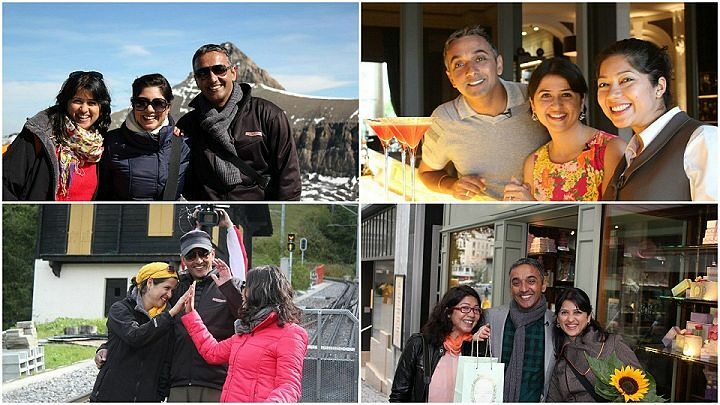 Anita is the powerhouse behind the success of TemplePilots as the top School and Club in the South East Asia region.Recently featured in NDTV “Swiss Made Dreams” this candid couple is flying brilliantly high. Anita: For me its seeing smiles on our students or pilot students,those who come to us.They all come with their own lives at their back they have chosen to do this.They trust us and for 3 days they are putting everything to learn how to fly and we have to help them in this journey and finally when they fly ,that smile that connection they have with us is very unique.Its only something as beautiful and as natural on being outdoors and an outdoor sport can give you,nothing else.That's my motivation to see how much joy it gets to be with and hence to me. Avi: And it also comes from nature. To be in the sky ,to teach people to have fun in the sky and in an outdoor setting.It is also very inspiring. The journey of 17 years in Templepilots and how it all began? Avi: It began like I started to fly in the Himalayas and it was very beautiful,very gorgeous to fly in the big mountains.While flying a dream was born that this needs to be shared and if I can fly like this I think any and everybody can fly by taking part of this experience.That time it was a very new sport all around the world,specially in India where there was hardly anybody flying.There weren't any schools and I had just come out of the air force and found something aviation related so that's how the seed was born in the sky that we need to have Indian pilots in the Indian skies.This needs to be kind of done here because we have such a massive huge country,it is so beautiful and offers so many different kinds of flying in the big mountains or the hill stations.The weather is very conductive to flying as well. Anita: And when we started that time no one in India was actually taking up adventure sports as a very cool thing to do.It was just people who were in small towns or villages or near hill stations who used to pursue things like this.And of course in cities there was trekking and rafting and things like that,but aerosport was not pursued in this way.We had no road maps as such to follow.We had to really do our own research, our own study, trial and error.When we used to go and find sites we used to literally cut the grass while going to make the pathway,it was so raw.So it was very interesting to learn like that.When first few people came,like even if we used to get 4 students a month for us it was a great thing.And these were mainly people who had done travelling abroad who believed that it can happen you can learn flying like this.We both loved what we were doing,we didn't even have a Plan B that if this doesn't work what would we do,we were just fully into it. 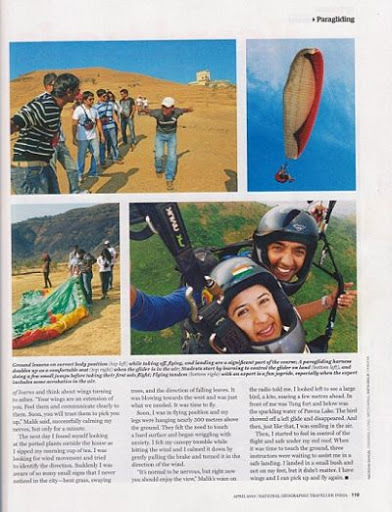 Are you the first paragliding school in India? Now I know how the birds feel.. It's just something words can't explain. Avi: We are not the first school as such.There were couple of units or groups that were teaching but very basic training was going on and they were mostly doing tandems,the 2-seated joy rides.What happens is on a hill station like Manali,you get tourists who don't have 3-5-10 days to learn to fly,majorly get people for joy rides.So a school would not run for a place like that. Anita: There's a difference between two things Joy Rides people would do to get a rush something like how you get on a roller coaster.But for people who come to school are different,they are passionate about flying.They want to take it up because they want to learn how to fly or take it up as a lifestyle sport and that's where we came in from his knowledge of airforce to whatever I could bring from the corporate side of the world. Avi: We were actually the first structured training school in India and a club which means you could continue flying.Like even in the Himalayas if you do a three day course,that's the end of that.Then you come back to Delhi or wherever that's the end of that.But we offer people courses and plus an opportunity for people to come on weekends and continue their flying,or help them buy gliders and become hobby pilots.We actually spread the culture of flying to encourage people become pilots. How did you both convince your parents to start something offbeat and unusual? Anita:For me,my dad was a total outdoor person.I was on my first trek when I was 6 years old.I think he secretly liked it that I wanted to do something different quite supportive but it was a shock for my mom.I was leaving my whole corporate career well paid job and going into complete unknown territory,she didn't like it at all.But somethings if you are passionate about you need to take your own decision.You have to have the courage of conviction.Passion doesn't demand asking for permission you just do it.You have to say "I am very sorry,I love you but I have to do this".I have been very independent very early on in my life. Avi:They themselves could not kind of fathom as to what is this.Nobody has done it,no body is doing it,they didn't see any future,they couldn't visualise any future and nor could we.And there was no road map or a plan as to this is how it'll work out,this is how it'll be.It was all just trying it out.It was a journey,an adventure in itself to find sites,look for sites,to fly those sites,make sure they are safe for training,then get people tell them what it is,convince them its not like suicide.On all terms it was a challenge in terms of marketing in terms of getting a set up in terms of creating a structure in terms of giving information about paragliding because people have such weird notion about adventure aviation.And hand gliding never took off in India.It was like finding a path in the jungle. Anita:Basically there were too many unknowns,I could not even tell her that this is the future or these people have done this we are doing something similar,I could have not given any assurance.Just have to tell them please trust us. Anita: To be with the person you love,and to do something you love so much everyday is my greatest achievement.I dunno how many people in this world can say that. And long back I realised my achievements and success would have nothing to do with money,or materialistic things.So I love this,not that I am not totally out of it,I love travelling,I need money for travelling and flying and it's an expensive sport.But this in itself is a great achievement. Avi: Because it was real adventure at that time in the beginning.Now its structured people know about us,set up and everything.Back in those days it was very new,very fresh so life was fantastic. Wasn't there any moment you felt this is not happening,I should give up? Anita: Never.That's really strange because at many times in this journey we were actually left with nothing,no money. 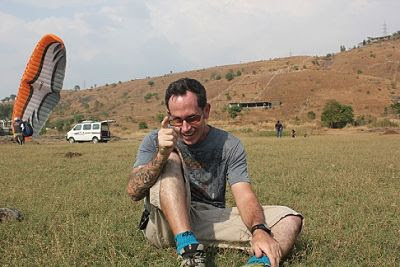 Avi: We didn't give us an option,or there was no option.I tried various things but they were not attractive enough to hold my attention,paragliding was the only thing I found bearable or that could hold my interest.Either this or nothing at all. Anita: Everytime there was a down,we could just fly and by flying we could tell ourselves "Why would I want to leave this?,why would I leave sharing this with others and make that into a career?" Avi: And actually when you fly it's an awesome experience,its so beautiful.Just because you are able to do that you will continue doing that.When you are not getting people to learn but you have a one hour flying in the sunset its so awesome things on the ground don't matter at all.You are just so happy that you flew and you are on a high,you would not think an alternate.Why wouldn't somebody else want to do this?There was never a doubt,we didn't know we'll have a school like this or training instructors or it'll be so successful or people would know us in the market or we'll have articles in the magazine.There was an invisible force that was driving us that carry on carry on because it was beyond reason beyond logic. Didn't you face the initial financial hiccups? Anita: We had some savings and we started off very small. How safe is aero sports in India now? Avi: It's like both the things are there - safer in some sense not so safe as well because it depends on the kind of people who get involved and how safely they practice the sport.For example the way it developed in Manali and Panchgani were extremely dangerous because it was a quick buck.People would buy a two seater for anybody ,just learn how to take off and land and start flying the tourists and for some quick money.And what was happening was all the European backpackers who would have some glider with them when they won't have money,they sell it without being responsible to who they are selling and what will be the end result.So lot of unsafe practices started in Manali.They are sometimes flying without helmets,flying poor quality equipment,so lot of accidents happen in Manali and Panchgani.Same thing happen in Bir.Fortunately Kamshet is not a tourist destination and we have always focused on training and creating pilots in the country.So its very safe here.These things happen at the touristic places where joy rides have dictated the direction of the sport and since there is no governing body,no national association it,it happens.It's a very new sports like it would be same 50 years back in Europe. People in India have a notion that aero sports/adventure sports are not that safe yet?They would rather do the same sport abroad. Avi: They have got reasons to feel like this.There are people and operators who don't have any experience,don't have knowledge,don't use the right equipment and they start to operate.There have been incidents of accidents because of very silly mistakes.So people are right in their own opinions. It is just like the airline industry.Initially when the airline industry was trying to establish itself in the mind of people that it is safe to do air travel they faced lot of problems.They had to put systems in place,procedures in place.And keep improving those systems and procedures,checklists and slowly and slowly people changed their view about air travel and started to trust even though there were accidents.Even though there are accidents but systems are so much in place that people trust today to travel by air.For example,our school we have systems in place procedures in place proper structure,we have been training for 17 years people have learned and flew safely.So people trust and they talk about it to others and then they trust and come.So we are creating large number of club pilots and pilots who are flying safely and they follow the discipline that the sport demands.They understand the limitations you need to understand,limitations of weather equipment,limitations of your own skill and knowledge so there is a sizeable community now which is flying safely.That is keeping the sport relatively safe despite some operators who are not giving that kind of impression in the minds of people with some accidents. 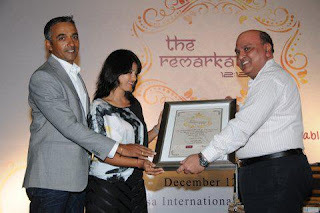 Anita: We are also associated with APPI which is an international organisation based in Switzerland and Avi is a master instructor on an international license.So we give out licenses to our club pilots.So they can pretty much fly anywhere in the world.We are following international norms of safety and training. Avi: APPI is an association of professional pilots and instructors based in Switzerland and they are the only international education system of paragliding.We are a registered school with them.We are 5 star rated school with them and I am the master instructor,the highest rating for an instructor.All the members of our team are registered instructors and assistant instructors.So they all have licenses and this gives people trust. Any future plans of expansion? Anita: We conduct flying at many places, we go to Nepal where we conduct advanced courses.We go to Himachal in bir.We go to Bali every year,this August again we'll be going.We explore different places and take our club pilots like a flock of birds going along. Avi: That's the most beautiful part of flying.When you learn to fly,you would want to fly to exotic locations.So I know how to fly I have got my own wings,and now I get them with my flock my community and we all go like school children with our gliders on a holiday.We fly by the Himalayas,by the coast,we fly in Nepal so in future we plan to conduct tours to Europe where we take our gang and fly in the alps and have fun like this,very special flying holidays. Anita: Combine travelling and flying.Generally paragliding sites are very unique,very off the normal sightseeing and then you get to see very different part of that land. 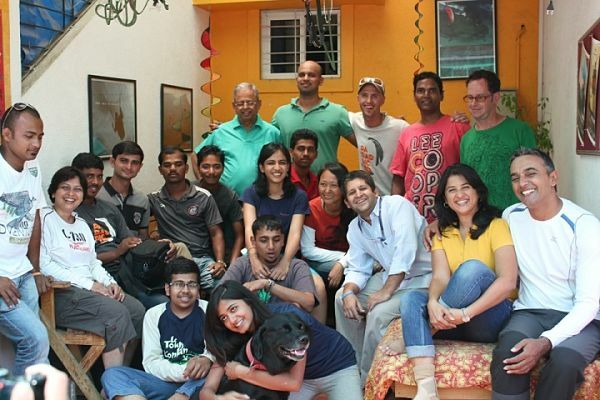 If there's one social cause you'd love to contribute to in India,what would that be? Anita: I would love to be associated with Animal welfare and more so related to elephants because I think they have been very neglected in the country which is associated with elephants. Avi: We are on the fringes of getting into this now because when we fly,we used to see so many more birds who used to fly with us before than they do now.Like earlier when we used to fly,there used to be 50-60 vultures flying with us but over the years they have vanished,population have just reduced.It's not so in the Himalayas though,I mean the vultures are not going extinct,you can see the healthy population over there but around us here we see.We have a dog ourselves.We have some vet friends who work in animal orphanages who tell us the stories of poor state of animals etc.We are deeply touched by the conditions and we would like to do something.Like in Junnad,there is a leopard sanctuary,very bad state the leopards are kept in.And these animal orphanage in Pune,people get birds and animals there but the department doesn't accept them.They don't want to take in more animals so they are stuck there.They have limitations of how many birds and animals they can keep.They don't have enough funds.We have lands and are trying to shift out of city and then we might be in a better position to do what we want to. There are these cows also who are left in the city they eat garbage,we need to do research in our area and decide what will be best.We also want to work with children and their education. Anita: If you dreamt it,you can do it nothing is out of your reach.If you really really love something and you are passionate about it,you can do it. Avi: First of all it really feels good that we are in a position like this as an inspiration.The answers too are very cliche but true.Please believe please have the faith and trust in yourself in the universe in the divine to achieve what you want.You will always always achieve it.Just go for it.Just don't compromise and settle for less.Be whatever you dream and go for it. Anita: The intention has to come out from purity and then it fulfills itself.The motive should not be selfish or self gratifying.The strength comes from it being pure. Avi: Very difficult question,it is for me because I am trying to free myself from likes and dislikes.She has her dislikes and likes,I would like to accept everything,I have no likes and dislikes. -He does not like dislikes,he aims to have complete balance.He wants to see everyone's limitations. Best experience in the holiday "NDTV Swiss Made dreams"
Anita : There were many.Wine tasting,cycling and Glaciar 3000.The mountain on the trek when we were on the top the view of the whole alps,that was gorgeous.There was a huge bird flying there,and it came right in front of us flying.And he gifted me a big sunflower from the market over there and I was walking the whole day with that.We loved the hotel we were staying in Beau Rivage and the evening we were walking there was a rainbow on the lake. Anita: I'd like to say that none of us in our lives need to settle for less.You can live fully without having to compromise and one can live by taking care of environment and surrounding without saying this is someone else's job,what does it got to do with me.Very very delicate web of life,everything matters. Avi: The future is very beautiful.The new life that is coming these days is very very beautiful,there might not be place for negatives and those who are not right.only people who are good and have consciousness bout nature will have place.The new consciousness which is coming is very great. Avi: Not like actual landing while flying, but to stay grounded in life. It was awesome meeting you two love birds on a paragliding high for 17 years.May god bless you and with your blessing may the environment around be more beautiful and inspired. I believe i can flyyyyyyyyyyyy. Nice photos. For adventure sports like mountaineering, river rafting,golfing etc Assam & North East India have immense potential . It's always a wish to visit such places , hopefully sometime will get a chance for the same. Have seen such locations in tv or internet only.